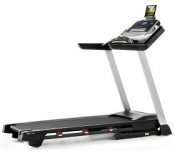 The ProForm Perspective 1.0 LX treadmill is an example of Proform’s merchandising habit of focusing on the sedentary population that needs motivation that has nothing to do with the actual workout. UPDATE: The Perspective 1.0LX is no longer available for sale. To find a comparable treadmill check out the new full lineup from ProForm to see which model appeals to you. You won’t find many fitness professionals who are big on ProForm treadmills in general, and at about $1,300 this isn’t the model that changes their minds. Although you may find the ProForm Perspective 1.0 LX on sale as low as $990 by doing some searching, experts agree that most of the money you’re paying is going toward the television and the folding mechanism, not toward quality parts. The ProForm Perspective 1.0 LX has cheap parts, a hallmark of this low-end brand by ICON Fitness, and the 90 day warranty reflects this. If you have over $1,000 to spend on a treadmill, go for a quality brand without a television set that has a good warranty and better parts. If you must have a television, buy one separately for a few hundred bucks and watch it while you work out. You’re being overcharged for the one included on this treadmill. The motor, although it is a continuous duty, is smaller than other 2.25 HP models, so it requires more rpm to maintain speed. Because of this, it tends to run too hot, leading to frequent overheating. 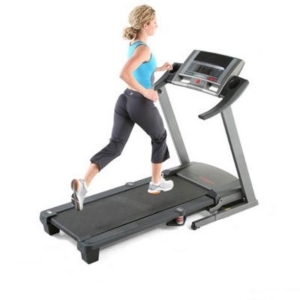 The ProForm Perspective 1.0 LX treadmill also advertises its “CooleAire Fan” for keeping you cool during your workout. In reality this is a small (4” wide) plastic fan, very cheaply made that doesn’t do that much. Again, you’re not getting much for the money. 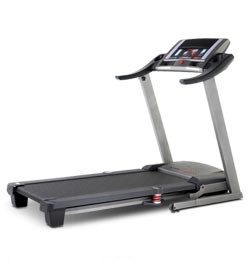 From our perspective, you can do far better for this amount of money by focusing on a treadmill with a high quality running deck, parts and console. You can also find a warranty that you can actually rely on.